Radm-ax is an industry leading 5 axis Laser CAD/CAM system developed specifically for the general engineering, automotive and aerospace industries. Radm-ax offers an intuitive environment for the comprehensive programming of multi-axis laser or water-jet cutting machines. By using Radm-ax, not only will programming time be minimized, the eventual cut-path will be far more efficient, saving further time on the machine. Add in the comprehensive simulation and proofing tools and you have a system that not only streamlines day-to-day production, it also reduces costly errors and eradicates the need for dry-runs. Radm-ax comes with an extensive range of integrated CAD data translators that allow the direct import of CAD drawings in their native form or as industry standards, such as IGES, STEP and DXF. The standard system configuration comes with interfaces for DXF, AutoCAD DWG, AutoCAD-Inventor, VISI, SolidWorks, SolidEdge, IronCad and IGES. Optional CATIA V4, CATIA V5, Unigraphics, Pro Engineer, VDA and STEP translators are available. 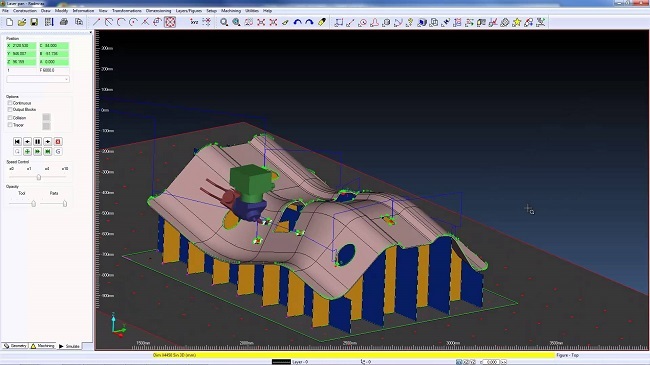 Radm-ax can display the CAD data as simple wireframe, solids and surfaces or a combination of both; which are used as the source for all cut-path programming and process simulation. Radm-ax contains a comprehensive database of laser and water-jet machines from a large number of Machine Tool manufacturers; including NTC, Prima, Trumpf and Amada. Should a machine not be supported, Radm-ax also contains a Machine Setup utility that allows the configuration of bespoke machine types and post processing information. The advanced postprocessors aren’t just limited to the use of generic G and M codes; posts are easily configured to suit different head configurations and table sizes. Stamped forms typically need to be held using fixtures and within Radm-ax this can be done in a number of ways. One way is to import clamps and fixtures from external files and then manually reposition them. Another way is to use the Fixture Design utility to create the support fixtures using sheet metal. Simply define the number of horizontal and vertical support sheets, how they interlock - including locking features if you require them - and how they run-off the part. Once these details have been defined, Radm-ax creates each sheet, nests them on standard sheet metal sizes, adds assembly notes such as number references and creates the NC code with which to manufacture them. Cutting operations within Radm-ax can generally be divided into two areas: inner and outer trims. Outer trims are the external forms of the part whilst inner trims represent the internal cut-outs and other features to be machined. The basic toolpaths for these cutting operations can be automatically generated by the automation tools built into to Radm-ax. User interaction is available for all toolpath types to allow for manual creation and refinement. Radm-ax provides a great amount of control over how each inner or outer trim is handled; for example, creating micro joints to hold the material in place until processing is finished becomes quick and uncomplicated. The toolpath can also be edited in terms of how the cutting nozzle is angled towards it or how it handles jigs and fixture features. Radm-ax has a wealth of in-built features that allow for the optimization of the laser toolpath. For example, by smoothing out the toolpath in areas around tight corners or small features, Radm-ax will optimize the toolpath to reduce the wear on the machine tool at the same time; ensuring that feeds and speeds are maintained across the job. Within Radm-ax the toolpaths are presented showing the angle of the nozzle as it moves around the part. Instant feedback is provided about whether or not a specific move is possible - either in terms of machine head movement limits or accessibility. Any collisions that are detected are highlighted both on the model and via on-screen messages. The trim-path parameters can be edited directly or, in the event of a collision, automatically corrected at any time; ensuring that your toolpath is both safe and using the optimum strategy to reduce processing time. Once the toolpath has been optimized, simply select the piercing and cutting conditions from the pre-defined technology tables and Radm-ax quickly generates reliable NC code. The NC code can be re-imported into Radm-ax and simulated within the same environment in which it was created. The NC simulation shows how the tool moves through space, allowing the toolpath to be sanity checked before any metal cutting occurs.